Dr. Downing is Hospital Director of The Downing Center for Animal Pain Management, LLC, the first comprehensive pain prevention and management practice for pets in Northern Colorado. In 2000 she was named the Hill’s Animal Welfare and Humane Ethics Award winner, and 2001 the World Small Animal Association presented Dr. Downing the Excellence in Veterinary Healthcare Award (Small Animal Veterinarian of the Year). Dr. Downing is a founder of the International Veterinary Academy of Pain Management, a Certified Veterinary Pain Practitioner, a certified veterinary acupuncturist, a Certified Canine Rehabilitation Practitioner (University of Tennessee), a certified Tui Na practitioner (Chi Institute), is certified in canine medical massage (CSU), and is certified in animal chiropractic (IVCA). 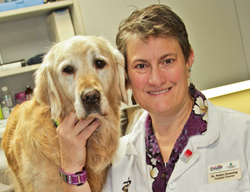 She is one of a handful of veterinarians to hold the Diplomate credential in the American Academy of Pain Management, the US’s largest interdisciplinary human pain management organization. In 2009 Dr. Downing became the first veterinarian to earn the designation Certified Pain Educator from the American Society of Pain Educators, a second human pain management credential. In 2015, Dr. Downing earned the Diplomate credential in the American College of Veterinary Sports Medicine and Rehabilitation. As an affiliate faculty at the Colorado State University College of Veterinary Medicine, Dr. Downing mentors post-graduate veterinarians, veterinary students, veterinary technician students, and veterinary technician assistant students from various college and graduate programs. Dr. Downing has been sharing her passion for facilitating, enhancing, lengthening, and strengthening the Family-Pet-Veterinary Bond with audiences around the world since 1996.